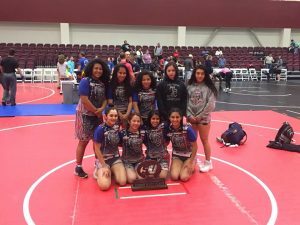 As promised the girls recap from their battles this past weekend at the 1st ever Schreiner University High School Dual tournament. 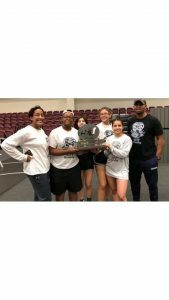 The girls teams weren’t as many as the boys teams but the level of wrestling was the same if not better featuring state champs and All Americans with girls bumping up in weight to battle other champs. Story By: Schreiner Head Coach Troy Jewell. The first annual SU Women’s freestyle dual tournament was Tuuuff!! The tournament brought in many of the best girls in the state. Out of the Houston we had Coach Thomas and the CobraKai team who brought a full bench. Spring Klein also filled a bench and their team was stacked! From El Paso Coach Martinez of Takedown Elite showed up with an outstanding team, they were young but extremely good. From Dallas/Fort Worth was Spartan and San Antonio NB Elite. Both of these teams were a little bit light in numbers but not in talent! We put them together to make a strong bench and give the other teams good competition. There were many good duals in the tournament and all of the teams were very competitive. At the end of the day it was Spring Klein walking away with the the first place Trophy! The team was outstanding, a great mixture of very good young talent, and extremely experienced veterans. They had a good dual with Takedown Elite, and two very good ones with “Team X” (Spartan,NBElite). All teams had a couple matches with each other. They did a great job of moving their lineups around to get in there extras and get the best matches for their wrestlers. In second place it was Takedown Elite! Again, Coach Martinez did not bring all of his best girls on this team but he brought a talented bunch no doubt! Most of them new to the style, they battled hard and found a way to win the ones they needed to. This young team will definitely be “in it to win it” in the near future. In third place it was Cobrakai wrestling club! They had a strong bunch of girls who competed very hard. The effort was good enough to bring home some hardware and create some momentum moving forward. There were definitely some outstanding matches. Team X taking on Spring Klein provided some great watching. Senior state place winner, Madison Guinn had a couple of great matches with state champion Matty Parker. Both matches displaying extreme physical wrestling, and both girls showing their toughness. We had some young ones in the tournament really sure what they were made of . Seventh grader Michaela Guerra of NB Elite winning all but one match against the older competition. Other stand out performances came from the younger sisters of SU commits Nathaniel Sandquist and Brodey Beckman. 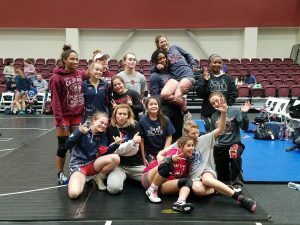 Seventh grader Madison Sandquist went the distance with a few outgoing seniors, pushing the matches to the last seconds to determine the W. Avery Beckman a sixth grader of Vici wrestling club, gets a fall over a senior state place winner! Both of these young girls are exceptionally talented coming out of the Houston area. end the match and Pettis did what good ones do, she got right back up and got after Fournier. Kaylynn Albrecht going up a weight class to wrestle Hunter Robinson! It was a match that both of their coaches wanted to see happen. Two big strong girls both wrestling extremely well in the tournament. It was a great opportunity for both of them and they took advantage of it. A lot of good matchup’s went on until everyone said they were done and had enough. There were tons of exceptional performances. I believe Xochitl teched or pinned everyone through the tournament. Sierra Brown-Ton looked really strong, as did Maddison Brown and Matty Parker. 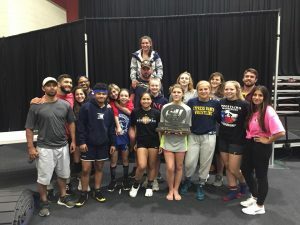 Alicia Messer, SU commit, showed her freestyle experience when she knocked off not only a UIL state place winner by fall, but teched and pinned this year’s UIL state champion. Heading down toward the right weight class, she’s getting good in the right style at the right time. Lots of great performances by many of these girls. 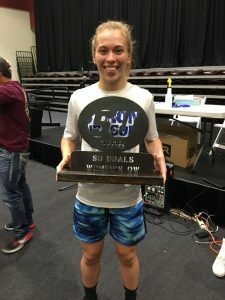 One of the most physically dominate wrestlers on the mat Sunday, and this year‘s SU freestyle duals OW, goes to Kaylynn Albrecht! She literally pounded the tournament, only giving up one point the entire day, and wrestling some of the best in the state in the process. Congratulations Kaylynn on an absolutely dominant performance at the first annual SU freestyle duals. Thanks to all the invited club teams that came out for the women’s tournament, hope to see all of you back next year!